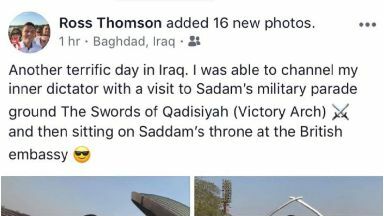 Ross Thomson said he was channelling his 'inner dictator' on Saddam Hussein's throne. Iraq visit: Ross Thomson posed for pictures on Saddam's throne. A Scottish Conservative MP has been branded a "disgrace" after joking he was channelling "his inner dictator" whilst on a visit to Saddam Hussein's former parade ground. Ross Thomson, who represents Aberdeen South at Westminster, made the comment in a private Facebook post unearthed by the Herald. The MP was in the Iraqi capital alongside Lord McInnes of Kilwinning, director of the Scottish Conservatives, and the Liberal Democrats' Lord Purvis of Tweed as part of a parliamentary visit. 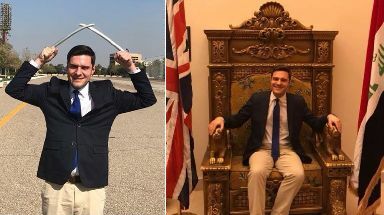 The 30-year-old MP posted pictures of himself posing under Hussein's victory arch and on the dictator's golden throne on the social media site alongside a smiling emoji in sunglasses. He wrote: "Another terrific day in Iraq. 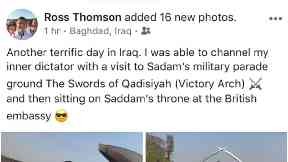 "I was able to channel my inner dictator with a visit to Sadam's [sic] military parade ground The Swords of Qadisiyah (Victory Arch) and then sitting on Saddam's throne at the British embassy"
Emoji: The MP included an emoji on the post. Hussein's 24-year long reign of terror was brought to an end in 2003 when US forces swept into Baghdad and toppled him from power. The former Iraqi president was sentenced to death three years later after being convicted of crimes against humanity for his ordering of the execution of 148 Shia civilians in Dujail in 1982. SNP MSP Gillian Martin said any politician that attempts to trivialise Hussein's regime should "be ashamed of themselves". She added: "For a Tory MP to be so crass on this latter point this week of all weeks is beyond belief. Ross Thomson may try and pass this off as a piece of ill-judged buffoonery - but his behaviour is a disgrace. 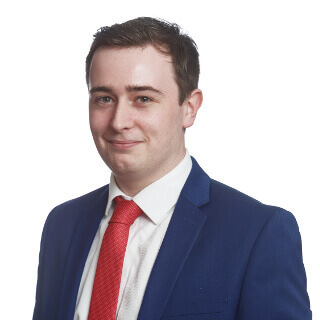 "The Tories should take swift and appropriate action against Ross Thomson. Sitting idly by as one of their politicians treats the legacy of a brutal dictator as a joke would be completely unacceptable." A Scottish Labour source said: "When he is finished committing cultural and political insensitivities abroad, he should explain to his constituents why Theresa May bypassed parliament to launch an attack on the sort of regime he privately appears to think is a subject for comedy." In a statement, Thomson said: "There was absolutely no intention whatsoever to cause offence. "My views on Iraq and the value of UK intervention in the region are very clear. "Britain and our allies liberated Iraqis from the prison that was life under Saddam. It was the right thing to do. "I find it astonishing that Gillian Martin and the SNP, who refused to back UK action in the face of a heinous chemical weapon attack in Syria this week, want to make an issue of this. "I would urge Ms Martin to visit the region herself and perhaps learn something about the Middle East."